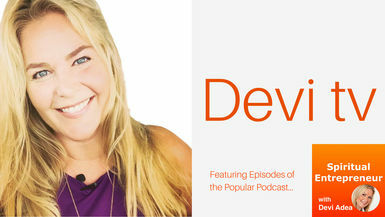 In this episode, Devi chats with Eva Gregory about How the Law of Attraction ReallyWorks. Eva shares her story of how she completely turned her company around and generated a highly profitable corporate buyout, using these very same principles that you will learn in this episode. This episode is chock-full of great practices, tips, and mastery level information on how to use the law of attraction in your life & business, how to master your mindset, and how to access your inner guidance to create what is in your heart. Eva is a master coach, law of attraction expert, intuitive and mentor to spiritual entrepreneurs. She’s simply one of the best when it comes to helping coaches, healers, holistic practitioners and other spiritual entrepreneurs learn how to tap into their own Inner Guidance and blend it with the proven practical strategies for creating a successful business. Eva has shared the virtual stage with some of the most respected thought leaders, including John Assaraf, Neale Donald Walsch, and Dr. Michael Beckwith among others and has co-authored the book, Life Lessons for Mastering the Law of Attraction, with Jack Canfield. How to move through the "breakdown" before the "breakthrough"
More about Eva:Eva is the author of The Feel Good Guide to Prosperity and Life Lessons for Mastering the Law of Attraction which she co-authored with Jack Canfield.